The 21st century mole demands no payments for his secrets. He sees himself instead as an idealist, a believer in individual sovereignty and freedom from tyranny. Chinese and Russian spooks will not tempt him. Rather, it's the bits and bytes of an online political philosophy that attract his imagination, a hacker mentality founded on message boards in the 1980s, honed in chat rooms in the '90s and matured in recent online neighborhoods like Reddit and 4chan. He believes above all that information wants to be free, that privacy is sacred and that he has a responsibility to defend both ideas. "The public needs to decide whether these programs and policies are right or wrong," said Edward Joseph Snowden, the 29-year-old former National Security Agency (NSA) contractor who admitted on June 6 to one of the most significant thefts of highly classified secrets in U.S. history. The documents he turned over to the press revealed a massive program to compile U.S. telephone records into a database for antiterrorism and counterintelligence investigations. Another program, called Prism, has given the NSA access to records at major online providers like Google, Facebook and Microsoft to search information on foreign suspects with court approval. The secret program has been under way for seven years. Snowden is "no different than anybody else," he claimed. "I'm just another guy who sits there day to day in the office," he said in an interview with the Guardian, which broke the story along with the Washington Post. 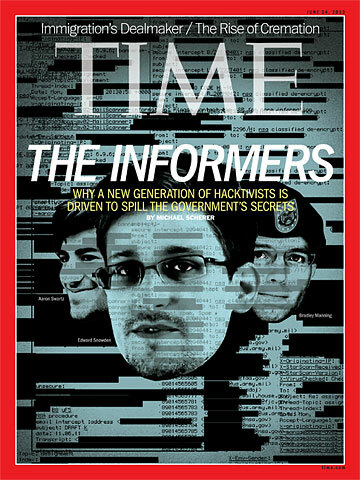 But Snowden, who was working as an analyst for the government contractor Booz Allen, is not just another guy. He is something new. More than 1.4 million Americans now hold top-secret security clearances in the military and the shadow world of intelligence. Most do not contact reporters and activists over encrypted e-mail in hopes of publishing secrets as civil disobedience. Few are willing to give up their house, their $122,000-a-year job, their girlfriend or their freedom to expose systems that have been approved by Congress and two Presidents, under the close monitoring of the federal courts. Snowden is different, and that difference is changing everything. The U.S. National Security infrastructure was built to protect the nation against foreign enemies and the spies they recruit. Twenty-something homegrown computer geeks like Snowden, with utopian ideas of how the world should work, scramble those assumptions. Just as antiwar protesters of the Vietnam era argued that peace, not war, was the natural state of man, this new breed of radical technophiles believes that transparency and personal privacy are the foundations of a free society. Secrecy and surveillance, therefore, are gateways to tyranny. And in the face of tyranny, the leakers believe, rebellion is noble. "There is no justice in following unjust laws," wrote Aaron Swartz, a storied computer hacker and an early employee of Reddit, in a 2008 manifesto calling for the public release of private documents. "We need to take information, wherever it is stored, make our copies and share them with the world."